If you haven't discovered the sheer, mouthwatering joy of Greek cuisine yet, we really suggest you should – and we've scouted out the places to try it. But you can also try to recreate the flavours at home with this recipe from Hungry Donkey. 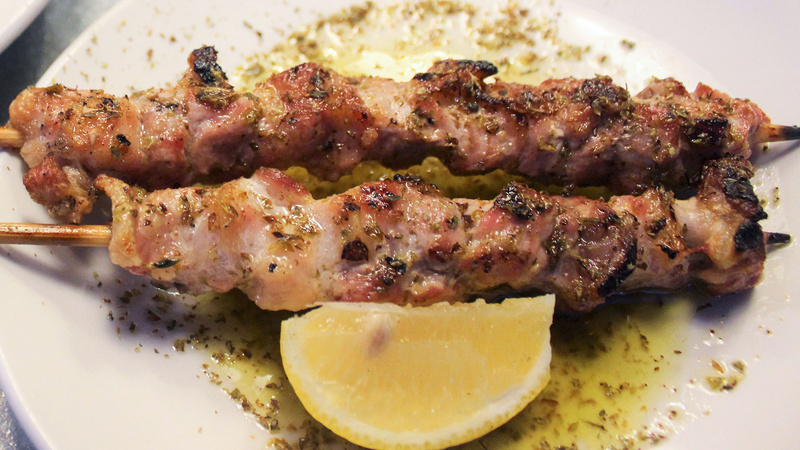 "Souvlaki actually means small skewer in Greek (souvla means spit)," says the restaurant's owner, Markos Tsimikalis. "It dates back centuries and was always an easy thing to eat on the go. I remember when I was a kid those small holes in the wall in central Athens and in small mountain villages, literally no more than 5-7square meters, selling just that: chicken and pork souvlaki with bread & generous squirts of lemon. As we get into summer this is a great bbq dish to prepare for everyone. Serve it with a nice Greek salad, tzatziki, pita bread to soak up the juices, and retsina – trust me, you don’t need anything else!" Dice the pork into equal cubes of 2.5-3cm. Skewer the pork belly cubes onto the bamboo skewer, leaving the tip free, and using up about half of the skewers length. In a bowl mix the olive oil, oregano, salt and pepper, and then brush your skewers. Just before throwing your souvlakia on the hot grill season generously with more salt. Throw the souvlakia on the grill (be mindful of positioning as you don’t want your bamboo skewers to burn off), and cook each side for about 4 minutes. After about 15 minutes take them off the fire and drizzle with lemon and more salt.